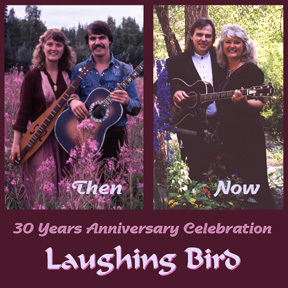 Laughing Bird: Performing songwriters and recording artist entertainers, Tupelo and Janey Kenyon are a contemporary folk-rock duo. These singer songwriters are both acoustic based multi-instrumentalist and excel at upbeat, positive, original songs by Tupelo Kenyon. 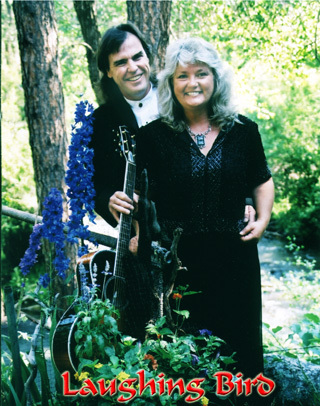 Their music spans many genres including progressive folk, light rock, new country, instrumental, fingerpicking acoustic guitar, new age, meditative, novelty, ballads, duets, and love songs. In Concert! 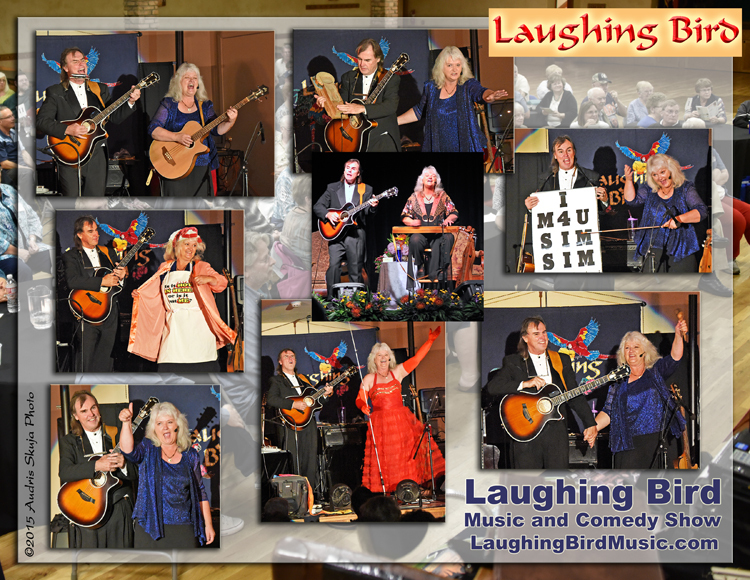 An upbeat, high-spirited music and comedy show filled with generous portions of laughter and love. WARNING: This show is disasterous to the doldrums and hazardous to the blues. Free 16-page e-booklet for Activity Directors and concert hosts. Tap into the author's 180+ years of combined experience as full-time professional entertainers. 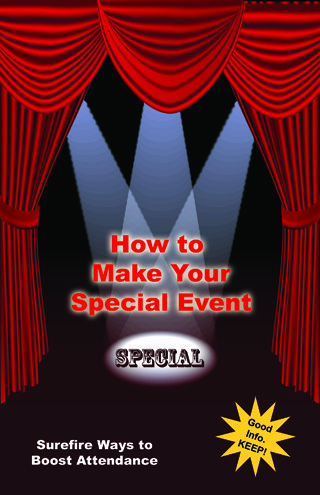 Here are proven ideas to help you maximize attendance and fun whenever you host a concert or any special event. Written by Laughing Bird (Tupelo and Janey) with our friends, Bernie and Red. Note: Click links above to see on screen. 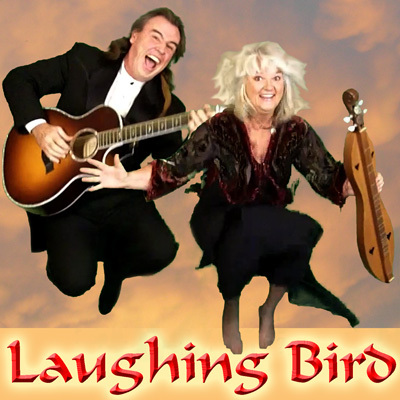 Click video to watch Laughing Bird, in-concert. Click video . . . short welcome from Tupelo & Janey. 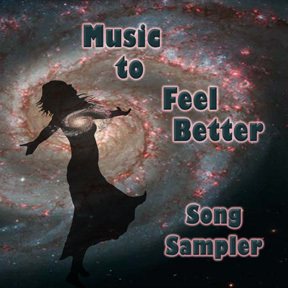 Download new album, "Music to Feel Better" and see our new video, "Feel Better First." Type your first name and email in the boxes below. Your contact info is safe and secure - NO SPAM. Fads in entertainment come and go with the generations. for over 40 years. So far, So good! celebrate personal growth, hope and gratitude. Entertainers, performing songwriters and recording artists, Tupelo Kenyon and Janey Wing Kenyon are a contemporary folk-rock duo. These singer songwriters are acoustic based multi-instrumentalist who excel at upbeat, positive, original songs. Their music spans many genres including progressive folk, light rock, new country, instrumental, fingerpicking acoustic guitar, new age, meditative, relaxation music, mood music, novelty, ballads, duets, and love songs. USB Flash Drive MP3 Collection of all 15 albums. Includes the 6 studio vocal albums and the 6 instrumental albums listed below, plus 3 more albums recorded live-in-concert . (Highest quality MP3 files - 320 Mbps - includes album graphics and lyrics to all songs.) Also includes 2 videos: "Celebrate the Journey" (2 1/2 hours) plus "Special Features" (45 minutes, not available anywhere else). Instrumental Box Set - 74 Songs on 6 CDs (over 6 hours of music). CDs included in this instrumental set: Speechless, Wooden Voices Volumes 1 and 2, Celestial Sounds of Harmony and Light Volumes 1 and 2 and 3. “Speechless” CD - 12 songs, 55 minutes - Soaring guitar harmonies are featured on this collection of high-spirited instrumentals. Energetic. Fun! Download mp3 - Individual songs or the entire CD from iTunes store. “Anthology Box Set - The First 37 Years” - 6 CDs of studio recordings including vocals- 102 songs, 7 hours of music. This collection of original songs represents 37 years of recording and performing together. CDs included in this set: Still a Mystery, Glow, Record-X (Laughing Bird's 10th), Here Like a River, Close as a Heartbeat, Anthology (The First 20 Years). "Wooden Voices, Volume 3" - 15 songs, 62 minutes - Acoustic guitar instrumental music, accompanied by other mellow wooden instruments. Relaxing and inspiring. "Still a Mystery" - 17 songs, 76 minutes - Upbeat, positive themes. Lots of vocal harmonies and many instruments. The Other Shore, Wild Ride, Trouble, Dream Weaver, Beyond the Blues, You Through My Eyes, Flutter, The Folksinger, The Three of Us - Father and Son, Dressed Up for Forever, Music and Friends, Ice Flower, Hide and Seek, How It Is, I Miss Your Face (Tribute to Dad), Inspired on Purpose, Time Has Come. "Celebrate the Journey" DVD - Live, in Concert Video - 25 songs from many different locations plus personal interviews and hundreds of photographs. This lively retrospective is an overview of Tupelo and Janey Wing Kenyon's unique lifestyle as a touring musical duo, on the road together since the mid 70's. Available in DVD. 2 hours and 32 minutes. "Record-X, Laughing Bird's 10th" - 16 original songs, 63 minutes - Our most recent studio album. Uplifting and joyous. Tender love songs. Wide variety of styles. Song Descriptions - Includes links to "Listen Now" (Streaming mp3) and links to "Lyrics and Chord Charts". "Here Like a River" - 17 original songs, 72 minutes - Love, travel and adventure songs. Music to give you a lift! "Close as a Heartbeat" - 14 original songs, 58 minutes - Studio album. Love songs, travel songs, and music to celebrate life. "Anthology - The First 20 Years" - 20 original songs, 74 minutes - A compilation album of selected cuts from our first two studio albums, "Reach Out" and "Tisra Til II" plus other new songs. Lots of love songs, and other songs of the heart. Song Descriptions -Includes links to "Listen Now" ( Streaming mp3) and links to "Lyrics and Chord Charts". "Have Tunes, Will Travel" (Live, In Concert) - 20 songs (6 original plus 14 favorites from other songwriters), 72 minutes - A mixed bag of some of our favorite songs and the most requested songs from our live performances, spanning many years. Songs to touch your funny bone as well as your heart. "Celestial Sounds of Harmony and Light - Volume 1" - 11 instrumental songs, 61 minutes - Imagine this as a soothing musical massage; a relaxing sonic shower of peace and joy. Use this music to deepen your relaxation and enhance your meditation, contemplation, visualization or daydreams. The comforting sounds and tranquil pace (approximately 60 beats per minute) is especially good for relaxing the mind and allowing you to ease into alpha state. Watch your stress melt away as you become mentally refreshed and emotionally recharged. It’s also perfect to set the mood for study, reading, writing, yoga, tai chi, and romance. Or, just get comfortable, close your eyes, and see where it takes you. Enjoy this magic carpet ride into the true last frontier . . . inner space. Song Descriptions - Includes links to "Listen Now" (Streaming mp3). Listener Comments - Wow, what a diverse and gratifying collection! Thank you. Download mp3 - Individual songs or the entire CD from the iTunes store. "Celestial Sounds of Harmony and Light - Volume 2" - 9 instrumental songs, 60 minutes - Imagine this music as a relaxing whirlpool of peace and joy. Notice how easily tension melts away as you bathe in these comforting sounds. The tranquil pace averages 60 beats per minute. Melt into deep relaxation as your heartbeat and breathing gradually get in sync with the gentle pulse of this stress-busting music. Breathe in these mellow sounds to become mentally sharpened and emotionally rejuvenated..
Like "Celestial Sounds - Volume 1", this mellow music is great for setting the mood for reading, massage, body work, yoga, tai chi, and romance. Or, just get comfortable, close your eyes, and have a nice ride. Download mp3 -Individual songs or the entire CD from iTunes store. "Wooden Voices" - 15 instrumental songs, 62 minutes - Acoustic guitar instrumental music, accompanied by other mellow wooden instruments. Relaxing . . . inspiring . . . rejuvenating . . . a satisfying pick-me-up that simply makes you feel good. Naturally. "Wingin' It - On the Edge Adventures"
. . . . . . . . . . by Janey Wing Kenyon . . . . . . . . . .
24 heart warming short stories spanning over 30 years of world traveling while living on the edge. Includes photographs. "Wingin' It - On the Edge Adventures, Audio Book" - 8 hours of masterful storytelling by Janey Wing Kenyon. The stories are read by the author. And if you know Janey, you can imagine how exciting and animated her own stories become when she breathes her enthusiasn into them. Janey's music is scattered throughout her stories which adds a rare quality of depth and dimension. Instrumental music composed by Tupelo is an extra bonus. Their talents combine to add personal and poignant facets to the stories, making them shine. "Folk Tales for the Young at Heart" by Janey Wing Kenyon. - A collection of 10 heart-warming children's stories plus one song. The Cobblestone Cutter, The Frugal Taylor, Evergreen, In and Out, Old One-Eye, No Elbows, The Fat Man, The Perfect Rainbow, Hairy Hag of the Bog, Not Much Happening, Mockingbird. Discover in-depth articles on purpose, passion and productivity . . .
Strong relationships, communication, health and well-being . . . and much more. Each article is accompanied by thought-provoking quotes and free, streaming, original music. Enjoy soothing instrumentals as you read plus songs specifically chosen to support the tone and help illustrate the ideas of each article. This site is designed to jump-start your creativity and help you feel good. Celebrate life by taking control of your expanding consciousness and personal growth . . . your way! Music is for sharing. A song is useless and worthless unless someone hears it. As songwriters, it matters to us that this music is heard. This is our passion, our purpose, our primary mission. Our main objective is to share music that matters with people who care. We believe that most people attracted to this kind of music understand the time, energy, money, and lifetime dedication required to create and record these songs and maintain this website. Music is not only our life, but how we make a living. So, if our songs and our style resonate with you, please buy our albums directly from this website or download mp3s from iTunes. We are able to keep our prices low and offer FREE bonus albums because we are independent, and own all of our recordings outright. Thanks for listening, and thank you for keeping the music alive and flowing with your purchase. Our music lifestyle is a journey from the heart, driven by our love of new places, new people and new expriences. Thanks to you, our musical adventure together has taken us to all 50 states and many other countries since we first started singing together in the mid ‘70s. We appreciate your purchases, contacts and referrals that have helped us to continually take the next step. Some people buy two or three of our CDs at a time to get the FREE CDs to give as gifts. Others take advantage of our wholesale prices to resell our CDs in catalogs, natural food stores, shops and businesses involving massage, yoga, tai chi, new age, etc. (Wherever positive music is sold.) We are happy to be able to offer FREE CD specials and quantity discount prices. All our albums are longer than average ... three of them are as long as many double albums. We like giving more than your money’s worth! Syncronicity has been a good compass for us through the years and we are grateful for people like you who have played such an important role in keeping this music flowing. Get our new album FREE, see our new video and you'll also get a free subscription to our newsletter, "Inspired on Purpose." We will send you updates occasionally about our new recordings and tour schedule. (We safeguard your privacy. We don't give your contact info to anyone. Period. We appreciate you!) You can download the new album immediately. And, the new video will begin playing as soon as you enter your name and email address and click the "Instant Access" button below . . .
Hey, you guys are a find, for sure. How to say this next part diplomatically... There are many people making music that's meant to be "uplifting" that have lovely intentions, but their music, for me, doesn't quite keep up. I have at this point played everything you sent me except for the DVD. I appreciate the excellent, quality production. Plus the fact that both of you sing and play well. It really does all work together. You two have the message part and the music part, and that can be, IMHO, a bit hard to find. So, all of that as a prelude to also saying "thank you!" And I am so excited there's a 2nd Wooden voices disc - yippee!! I write, and it's lovely to have good instrumental music because I can't play music with words when I'm trying to, basically, channel. Thank you for sharing your abundant thoughts and love. I am always delighted to hear from you, and your messages tend to leave me with radiant blessings. Accept my gratitude and love in all your radiant magnificence. Neslyn Watson-Druee. Smiles to My Face, Tears to My Eyes And Love to My Heart!!! Lets see, the truth is that Celestial Sounds is truly motivational. If I ever don't feel like starting my yoga early in the morning, all I have to do is turn on the music and the first song draws me into my practice. By rhythmically combining breathing through the Sun Salutation to the perfect count of the first cut (Rainbow Hue), I find myself awake, warmed up and ready to move into the Moon series for the second cut. The tinkle twinkle breaks between the cycles of cut 1 provide the perfect rest and inner focus times before moving into the subsequent rounds of the flowing sun salutation asana. After the first two cuts and thus completing the sun salutations and moon series, I then easily flow into other postures. Whenever I'm ready to rest in the corpse pose, the music is gentle accompaniment to deeper relaxation. Thanks again for helping to ease me back into the movements. It really does help so much as it provides a wonderful paced warm-up. Here's to energy flow! We meet in that lovely little hotel near Chiang Mai in Thailand when you and Janey gave us that impromptu performance in the restaurant, complete with spoons! I was the guy from the UK who really appreciated your thoughts and songs and said that you seemed like very spiritual people! Well what a surprise to find your web site and to receive such uplifting emails and music on such a regular basis. I would just like to say a personal thank you for all your thoughts and links they have been a key part of my life since we met. I have to say as a former atheist with a scientific background, that trip to Thailand changed my life, and I am very happy to say that my Spirtitual new self is such a nicer place to be. FABULOUS, INCREDIBLE, OUTSTANDING SUPERB, AMAZING, GREAT, DELICIOUS, ABSOLUTELY (#!&BLEEP*#!) BRILLIANT!!! I truly loved the CD, "Here Like a River." And without a doubt, it is your best work yet. You should be very proud as I am sure you are. I specifically put my CD player with head phones in my carry on bag from Seattle to Boston so I could listen. It made my looooooooooong flight totally enjoyable for over an hour. Here we were on our connecting flight from St. Louis to Boston, Monte's reading "Winging It" and I'm listening to "Here Like A River." Wow, could we feel your presence. You guys are an inspiration. "Life is a complex tapestry. Each small fiber holds the promise of love and fear, hope and despair, angst and elation, sorrow, beauty, but most of all, joy. We have the choice to twist and turn our tapestry to the light or to the shade. We either cower under it or we wear it upon our shoulders like wings." I feel things the same way. Your beautiful words touch my heart and I feel my self very strange. You are really an amazing woman. My best regards to you and Tupelo. - Aniola Dimova, your fan from BULGARIA. I go for physiotherapy and a deep tissue massage every week, I brought the Celestial Sounds album with me and we played it during my session. It was a perfect score and extremely relaxing. We both enjoyed it. She asked me for pricing if she were to buy 10 and see if there is a market amongst her customers. Dear friends, I want to thank you for the wonderful concert, and for the generosity you consistently manifest in a number of ways. I very much admire the way:you live your lives your creativity in many forms your enthusiasm and joy, your love for each other.